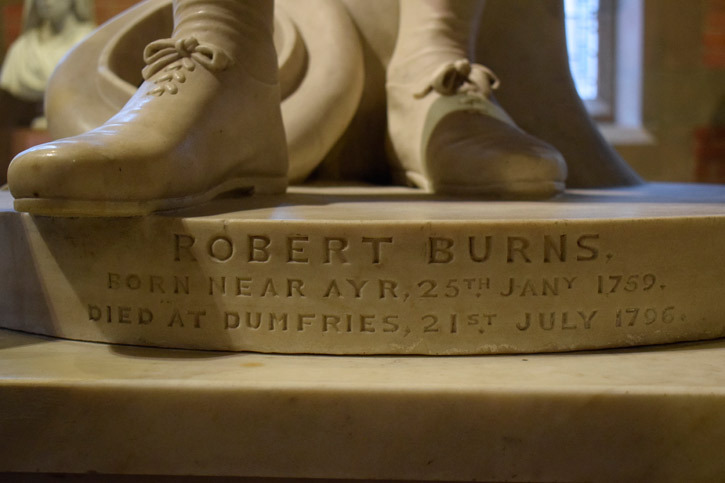 He’s still regarded as Scotland’s national poet more than two centuries after his death, and his birthday is celebrated every January at Burns Nights across the world – filled with haggis, pipes, poetry, songs and a generous helping of whisky. But when a plan was hatched in 1812 to build a colossal national monument to Robert Burns and install it in the centre of Edinburgh, the money to fund it was not raised in the Bard’s home country, but by Burns enthusiasts in Mumbai (then Bombay). The resulting work became the iconic sculptural portrait of the poet, but it was moved from place to place around the Scottish capital during the nineteenth century because of concerns that are still significant for public art today – conservation, pollution, financing and public accessibility. In Bombay, it was John Forbes Mitchell of Thainstan who first came up with the idea to raise funds for a national monument to celebrate the Bard, who had died at Dumfries in 1796. Forbes Mitchell was a Scotsman, Burns enthusiast and merchant of the East India Company who was living and working in India, and in 1812 began a subscription scheme to fund a huge bronze statue in Edinburgh. By 1819 more than £1,500 had been donated, and Forbes Mitchell travelled to London to discuss his plan with a group of aristocratic Burns enthusiasts. The meeting was supported by some highly influential figures – held in the Freemasons’ Tavern, it was chaired by the Duke of Atholl under the patronage of the Prince Regent, and those present formed a monument committee. 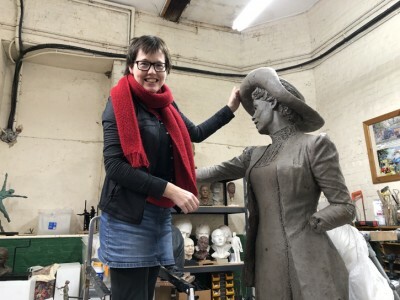 The plan was approved, but it was decided that a life-size marble sculpture would be a more suitable memorial, to be housed in one of the Scottish capital’s fine buildings – preferably the university library. In 1824 the committee commissioned John Flaxman, the most famous British sculptor of his day, and by then nearly 70 years old, to do the work for an agreed fee of £1,400, though he had offered to do it for nothing. In order to create a good likeness, Flaxman was sent the oil portrait of Burns painted by Alexander Nasmyth in 1787, as well as an etching by John Beugo. Nasmyth had been a good friend of Burns, and the poet’s son had confirmed the painting looked a lot like him (it is now on display in the Scottish National Portrait Gallery). It shows the poet aged just 28, was painted from life, and has become the best-known and most widely produced image of Burns around the world. In December that year, before the work could be completed, Flaxman died, and along with many of the artist’s other unfinished works, the sculpture was completed by his brother-in-law and pupil, Thomas Denham. By the time the work was finished, the funds raised had increased to more than £3,000, so with the remainder of the money the committee decided to construct a monumental 'temple' to house the sculpture, and instructed the Greek-revivalist architect Thomas Hamilton, who had designed the Burns Monument in Alloway. The foundation stone was laid in 1831, but right from the start there were concerns about its location at the bottom of Calton Hill – it was close to foundries, breweries and gas works, and by 1836 George Thomson and notable Edinburgh figures including Lord Henry Cockburn, the judge and architectural conservationist, were suggesting it should be moved – partly because somebody had to be paid to look after it, so the public had to pay to see it. 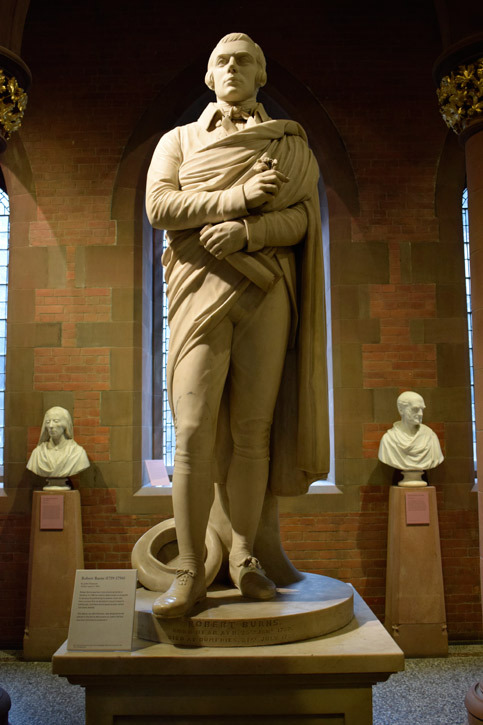 The statue stayed in the library until 1861, when it was moved to the recently opened National Gallery of Scotland, a location it was hoped was more accessible to the public. 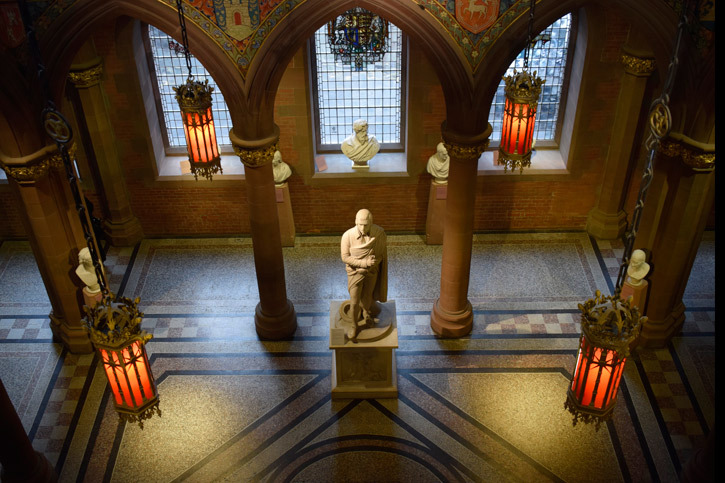 It stayed there until 1889, when the Scottish National Portrait Gallery on Queen Street opened – the pantheon for the statues and busts of eminent Scotsmen (and women) that Scotland had been lacking. It has stood in the Great Hall ever since, is the site for an annual wreath-laying ceremony around Burns Night each year, and was one of only two objects from the National Galleries of Scotland that remained in the building when it was renovated between 2009 and 2011. 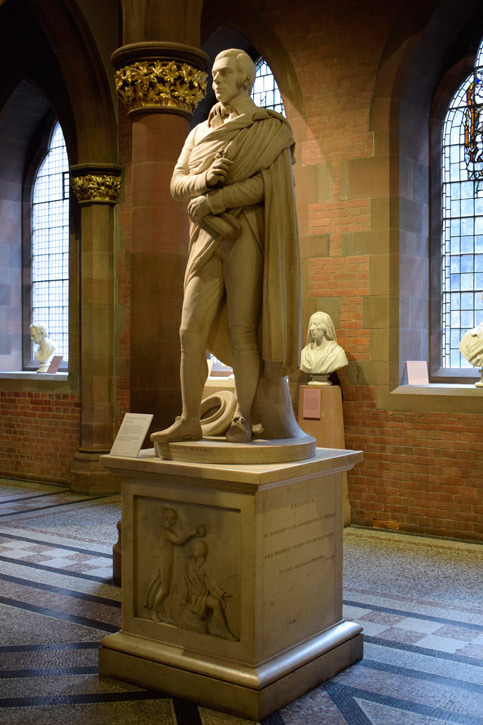 In 2017 Douglas Gordon, the Turner Prize-winning artist, used the work as part of his installation for the Edinburgh Art Festival, questioning the depiction of Burns in the sculpture as a national hero. For Black Burns, Gordon used black marble to create a replica statue, which he then shattered and displayed on the floor of the gallery at the foot of Flaxman’s sculpture. Thanks to Imogen Gibbon, deputy director of the Scottish National Portrait Gallery, Becky Howell, archivist at the National Galleries of Scotland, and Helen Scott, curator at the City of Edinburgh Council.